Juan Luna-Avin was born in Mexico City. He is a multi-disciplinary artist whose work examines individual and collective identities through the lens of youth cultures and rock n’ roll music and reflects his interest in mythology, music history, memory, low-fi technology, and informal economies. His work has been shown at the Thomas Welton Art Gallery (Stanford University), San Francisco Museum of Modern Art, Yerba Buena Center for the Arts, Queen’s Nails Projects, Casa del Lago (Mexico City), and Ceroinspiracion (Quito, Ecuador). In 2007, he collaborated with Julio Cesar Morales on a public art project commissioned by the City of San Jose. He is currently a Lecturer in the Visual and Public Art department at California State University, Monterey Bay. For his CSA piece, the artist used Liquitex acrylic spray paint, block printing ink, and Chine-collé on 100% Cotton pale blue Stonehenge printmaking paper. The inspiration for the piece is handmade post-punk 7″ music singles covers from the late 1980s to early 1990s. 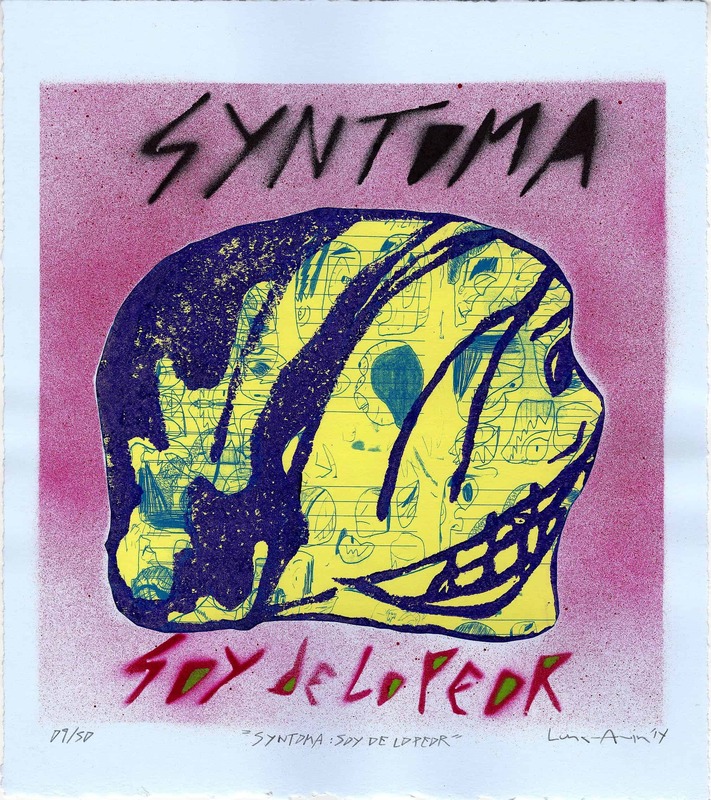 Syntoma was a band from Mexico City who created electronic music in the early 1980s. Soy de lo peor (I’m the worst) is the title of one of their songs from their only album, No Me Puedo Controlar (I Can’t Control Myself). It was released in 1983 and is the artist’s favorite song on the album. His CSA piece also includes a 12-page fanzine and stickers.